Immersion blenders are awesome tools for any kitchen – from home cooks to professional chefs. They act as all-in-one, portable, handheld alternatives to blenders, food processors, and more. They’re incredibly easy to operate, usually with a one touch function that turns the machine on or off. Just put all of your ingredients into a pot or container, insert the immersion blender, and go! You’ll have a great puree, smoothie, sauce, or or a super smooth soup in seconds. Aside from the ease of use and versatility of immersion blenders, another, possibly even more enticing, feature is their affordability. Since they’re very small, simple machines, they’re usually much more affordable than their larger alternatives. They can fit into any budget, but the ones I’ve rounded up for you below all come in at under $50. If you’re looking for an inexpensive immersion blender, check out the picks below. Don’t let the price tag fool you. The Cuisinart immersion blender is one of the most powerful on the list, and doesn’t compromise quality for affordability. It has a detachable shaft that’s easy to remove and dishwasher safe for easy cleaning. It’s also made out of stainless steel, which is very durable and won’t stain. The body of this immersion blender comes with a built in blade guard to protect your hands and fingers from the high powered blade. It also comes in 10 different colors, so you can pick and choose what would best match your kitchen’s style! If you’re looking for a simple immersion blender to puree your foods quickly and easily, this is the perfect option for you. 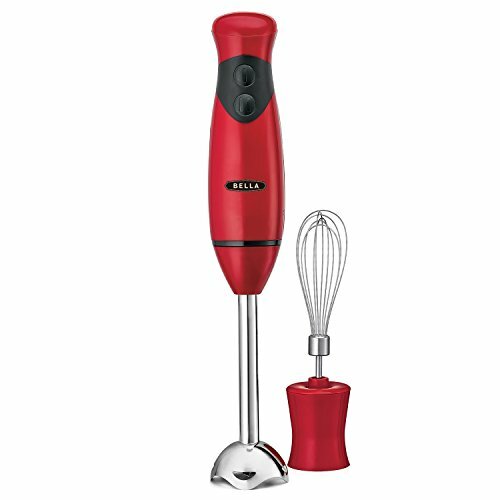 It’s cheaper than most other models because the head is made out of plastic, which may be an issue for some people, but it also comes with a stainless steel whisk attachment. Both of these are hand-wash only, though. It has a simple design with just 2 speeds, but the blades are sharp and powerful enough that this should be enough for any puree project you’re working on. It also works fast according to reviewers, who say they can whip up a large batch of vegetable soup in about 90 seconds. It seems like this Turbo Twister is appropriately named! If you want to kick your immersion blender pick up a notch without breaking the bank, check out Epica’s model. It has a fairly standard 350 watt motor and high quality stainless steel blades, but it’s also incredibly easy to use with a one click release for your attachments (it comes with standard mixer and whisk attachments). All of these parts are dishwasher safe, too. The primary advantage of this machine is its variable speed dial, which gives you complete control over the power and speed of your blender. This is a unique feature that’s hard to find in affordable immersion blenders. It also comes with a bunch of great accessories, including a 3 cup blending and storage jar with graduated markings, a suction lid, and pouring spout, and a 2 cup chopping bowl for solid ingredients. This is one of the best, and most versatile picks here on the list. This immersion blender is the most inexpensive on the list, coming in at under $20. You might wonder what makes this model so cheap, but this is actually a very high quality blender for its price. It’s not quite as high powered as others, with just a 250 watt motor and one speed. But, it will still work for smaller batches of soft sauces or foods if that’s what you primarily plan to use your immersion blender for. 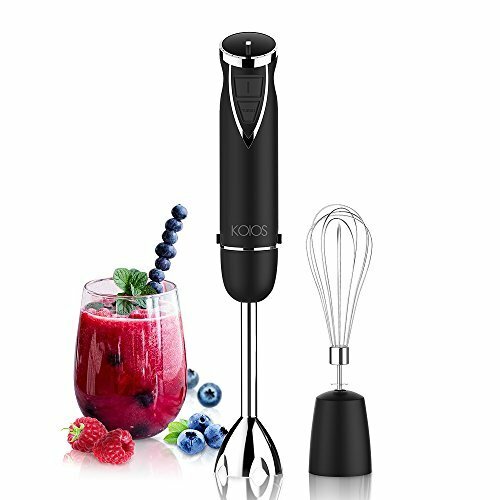 It’s great because it has a long 6 inch blending attachment and an interchangeable whisk, both made out of stainless steel, as well as a softly coated, ergonomic handle. It also has an auto shut-off feature and is odor and stain resistant. Both of the attachments are dishwasher safe, as well. It’s a great value if you don’t need a high-powered, high performance model. 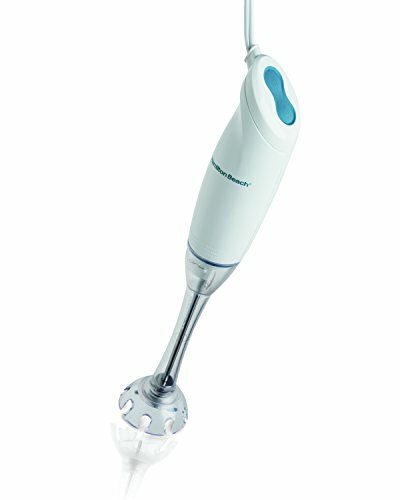 However, if you do need that high power, look no further than this powerful 6 speed, 500 watt immersion blender. It has a one touch on/off button, but you can adjust the speed and pulse as you blend. The shaft is also easily detachable for easy cleaning, which can be placed in the dishwasher. The blending attachments are also made out of that durable, high quality stainless steel you need from your kitchen appliances, and it comes with a built in blade guard for added safety. This is a great deal if you plan on making large batches of blended food, or if you just want that flexibility from your immersion handheld blender. 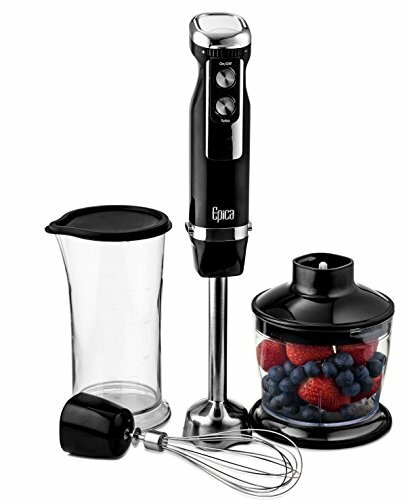 Personally, I’d go for the Epica Immersion Blender if i was looking for the best deal, the most versatility, and the best performance in an inexpensive immersion blender. It’s the best deal because of everything you get with the purchase, it’s got great performance because you get total control over its settings, and it’s very affordable. That would be my top recommendation, but think about your cooking habits and what would work best for your kitchen as well. What are your best immersion blender tips and recipes? Share below!